Glimmerglass Beach at Glimmerglass State Park is a "must-visit" destination when vacationing in Cooperstown, N.Y.
Glimmerglass Beach at Glimmerglass State Park. Glimmerglass State Park, located eight miles from the Village of Cooperstown, N.Y., on beautiful Otsego Lake, serves as confirmation that you are officially on vacation. Upon entering Glimmerglass State Park, expansive lush green grounds, gentle rolling hills and the mountain fresh air prepare the visitor for the impending jewel -- a sparkling, shimmering, pristine beach that seemingly comes out of nowhere to help you return to your best childhood memories. This is the type of place you learned how to swim, build a sand castle with friends you just made, eat mounds of hots dogs and "Hoodsies" at the picnic area, run around freely on the grounds to play catch or frisbee, and breathe in the summertime smell of suntan lotion, charcoal on the grill, and what we now have identified as negative ions -- the fresh smell coming from the water to make you feel great. This is the place we talk about upon returning from vacation in a "You had to be there" mode. Verbal descriptions cannot quite cover the feelings experienced in person at Glimmerglass State Park. Many other lakes have all the "parts," but the sum never adds up to a place like Glimmerglass Beach. Those who listen might think "What makes Glimmerglass different from the beach down the street?" will never understand unless they personally discover all the feeling of visiting this unspoiled gem in an untouched area of rural Otsego County. Everything seems to be just right, the prototype of what we expect from a beach -- clean waters, tranquility, a family safe atmosphere, attentive lifeguards, attractive grounds and the desire to stay there, forever. Sunset at Glimmerglass State Park. Glimmerglass State Park's main draw may be the beach, but there is so much else to experience year-round. Adjacent Hyde Hall is a spectacular mansion, certainly worth a look. Hyde Hall promotional literature accurately says it all: "Hyde Hall is a stunning reminder of a bygone American era when families of English aristocracy established vast estates in the former colonies. The house itself may well be the finest example of neoclassic country mansions anywhere in America. Roger Kennedy of the Smithsonian writes that Hyde Hall is "a great house, architecturally, and a social document of the first importance." The late former Sen. Daniel Patrick Moynihan called Hyde Hall "one of the most remarkable buildings in America." Glimmerglass is great for biking, fishing, hiking (there's an amazing view of Otsego Lake from an uphill trail within the Park), and in the winter ice fishing, cross country skiing, ice skating and snowmobiling. It is also an ideal place for camping, offering what is regarded as one of the best campgrounds in the United States. It would be easy to spend a whole day here, and do it all over again the following day, quite noteworthy considering all there is to do in the Cooperstown region. We've had those talks while still on vacation when talking to baseball-minded tourists who don't even know there is a great state park and beach just minutes from the Village of Cooperstown. 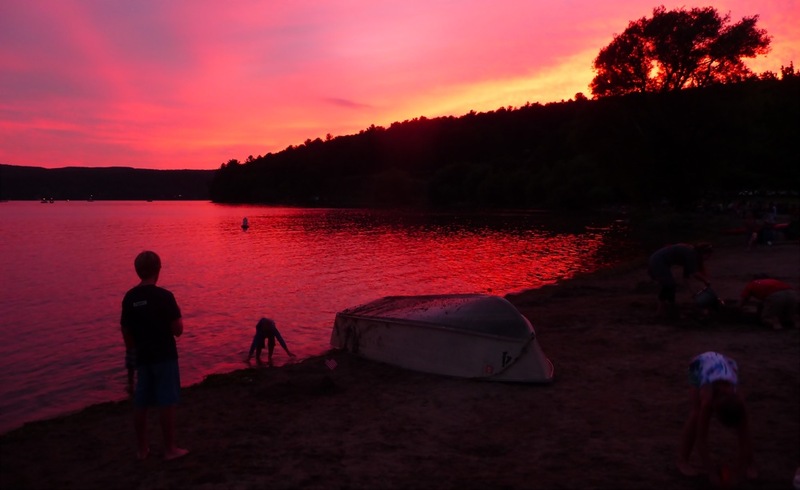 Consider it yet just another reason to vacation in Cooperstown, as Glimmerglass State Park joins other attractions in the area to make for a real family vacation. Glimmerglass State Park is located on East Lake Rd. in Springfield NY. For more information on Glimmerglass State Park, visit the New York State Parks web site.